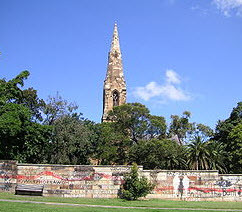 Newtown turns 150 this weekend, the event will be marked by the annual festival held at Camberdown Memorial rest park. But did you know underneath that park rests 10,000 graves?? Newtown and its melting pot of students, cultures, self professed weirdos, emos, goths, glam rockers, yuppies, carefree, artistic people and more has always been close to my heart. When my mum and I first moved to Sydney from Perth we moved to a terrace in Newtown and I went to Newtown public school, my best friend was Fijian and my other friend was Turkish, I was pretty much the only person from an english speaking background in my class. My mum was very groovy back then and it was not unusual to see her rock up to the school to pick me up barefoot with black nail polish and a hand made top. Back then in the 80s Newtown was pretty grimey and nowhere near as cool as it is now but it was always an area to find a lot of unique creative people. 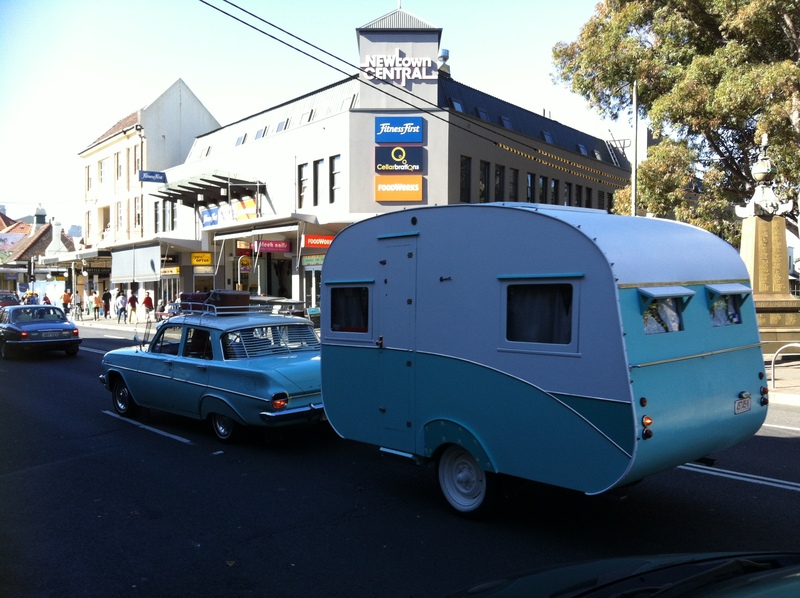 We later moved to the inner west where I grew up. Mum Returned to Newtown when I was about 19 SHe got a job as the Co-ordinator of Newtown Neighbourhood centre. They do amazing stuff for the community, I remember one year Mum and her team ensured that all the homeless People on the street had warm coats and shoes without holes in them for the winter. I would often visit mum for Lunch and pop into the neighbourhood centre, the team there was always a mixed bunch of passionate people who really cared about the community and Newtown not losing its identity! When Mum and I walked down King St in Newtown she new everyone, the buskers on the sidewalk, the locals and all sorts of funny characters that Newtown attracts. Often when I need some reflection time I visit the cemetery. It reminds me that many lives have gone on before us, battles have been fought hearts have been broken, Love has been found all hundreds of years before I was born. As a child I used to race ahead and stand on a grave (woops) and pretend I was a cupid or an angel statue and mum and her friends would say “wow, what a lovely angel statue”, I would chuckle and run to the next one and do it again and again. Did you know that the whole park surrounding the cemetery also used to be a grave yard?? I have been told that some days if the sun is right you can see the outline of the graves in the grass. 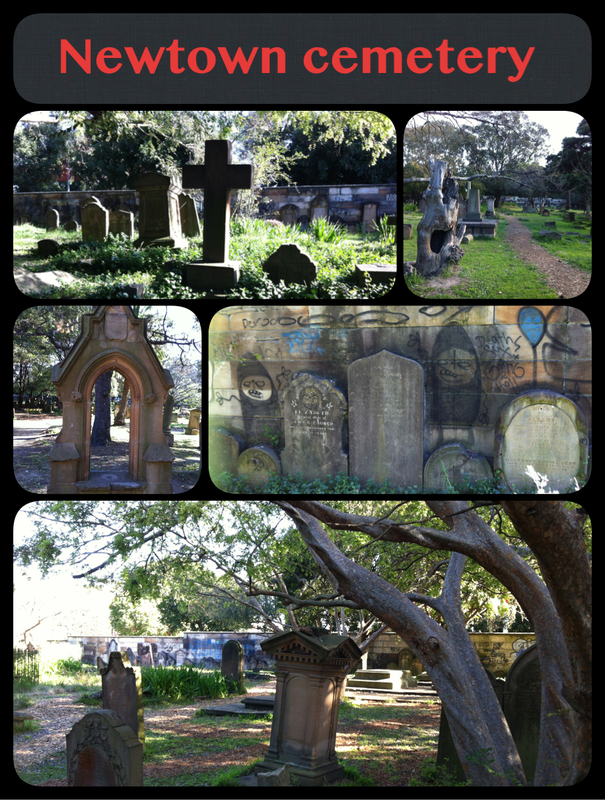 In 1848 the whole block was a private graveyard for All Sydney. Over 18,000 bodies are buried there. There are lots of stories about the earlier days, they say the near by residents complained because maggots used to surface when it rained a lot over in the section of the graveyard that slopes downward. On very cold mornings an eerie Miasmic mist (an emanation from rotting organic matter) was seen at the bottom of the hill around the graveyard. There are also a few reported ghosts who haunt the grave yard including a man in a coat, children are said to have spoken with him but he just watches people go about their business in the cemetery. Another character a man is in early 19th century military uniform can be seen viewing the stars with a telescope near the grave of Major Mitchell on Moonless nights. There are reports of many more ghosts that have been seen heard and felt. 100 years later A young girl was murdered in the cemetery( on 13th of June 1946) by this time the cemetary was overgrown due to lack of funds. After much public outcry the council decided they needed a public park due to the Eyesore that was the old cemetery and Sydneys’ rapid population growth, as a result ¾ of the now overgrown graveyard was turned into a park and all the headstones, well those that would fit now line the inner wall of the graveyard in 1950, you can still see all those headstones today. So this Sunday if you venture down to the annual Newtown festival, while you are licking your soft serve listening to cool tunes remember what lays beneath you is over 10,000 bodies!